Last evening the CCAR (my rabbis’ organization) Leadership trip began. 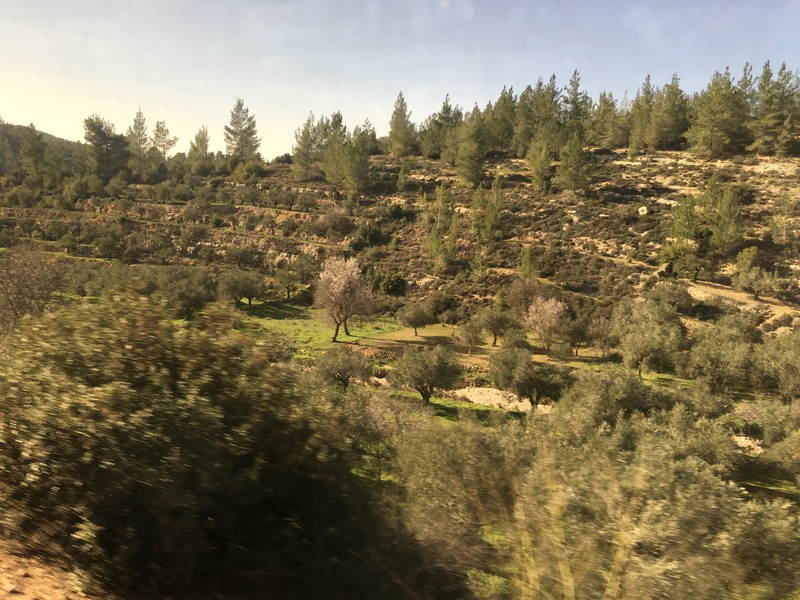 I said good-bye to Bili and Mats (whom I will see again in a week) and took a beautiful scenic train ride from Jerusalem to Tel Aviv, which I’d never done before. 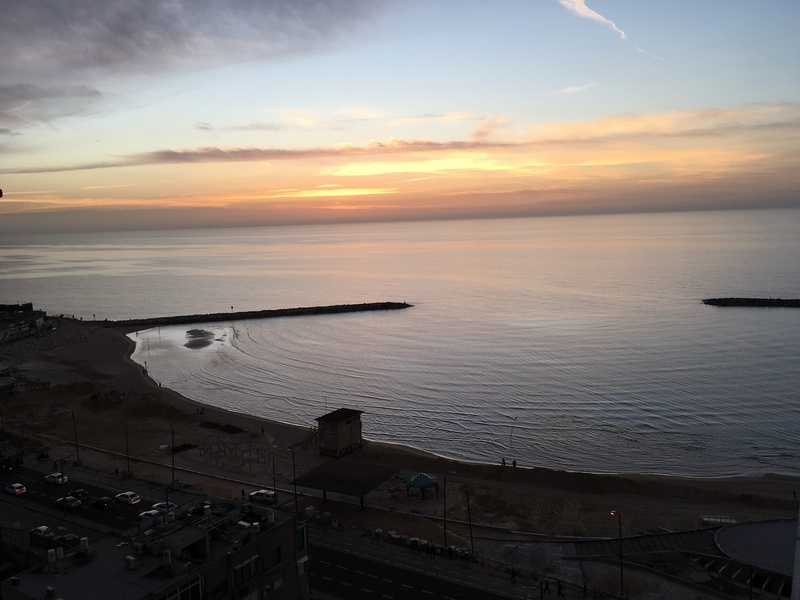 Our group gathered in the lobby of the Royal Beach Hotel in Tel Aviv at 6:30 PM, and I met the other eight colleagues on this trip, only two of whom I had not known before. Additionally, we are joined by our colleague Rabbi Hara Person who works for the CCAR. This morning my roommate Michelle (a rabbi in California) and I took an early morning walk along the beach before going to the amazing Israeli breakfast buffet at the hotel. And from there we were gone from 8:30- 6:30 PM, touring and walking and learning and eating. 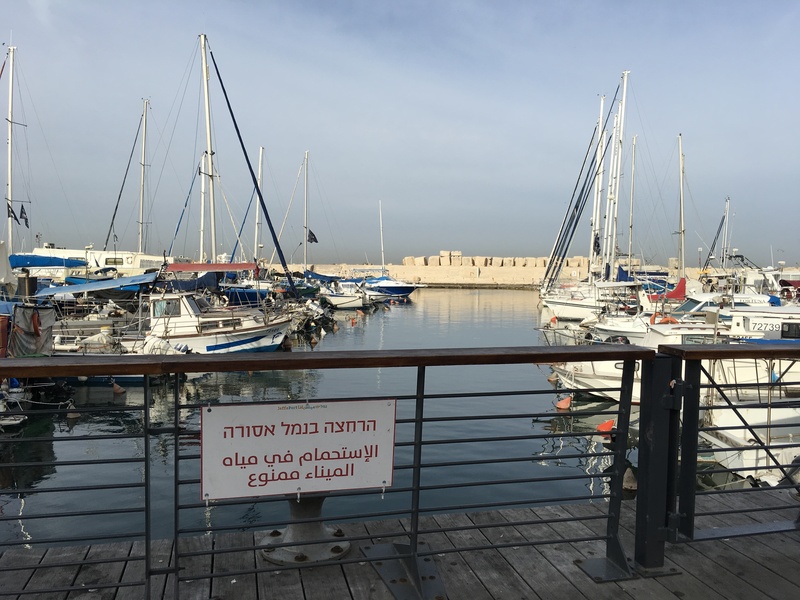 First off, a walking tour of Jaffa, starting at the Jaffa port which the Bible story of Jonah tells us is where Jonah embarked on his escape from God’s call. 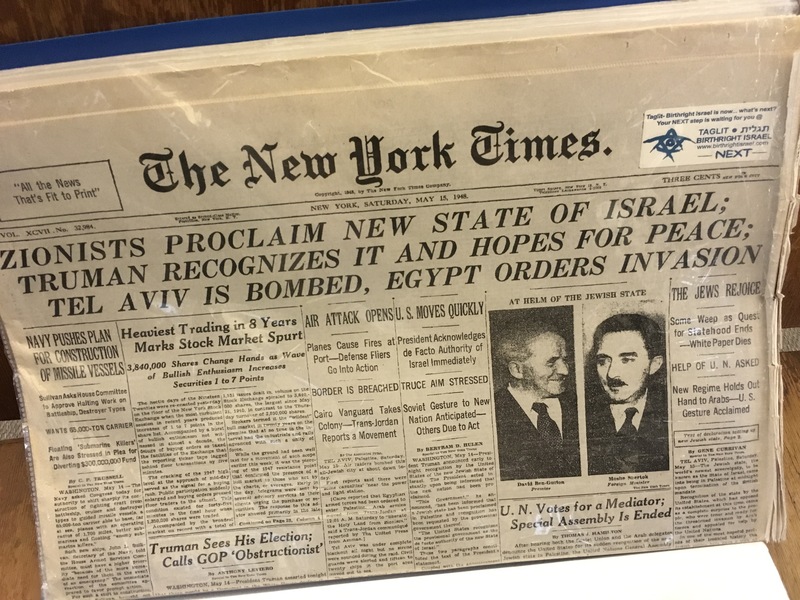 But for modern Israeli history, it is also where the first immigrants to Israel arrived in the late 19th century. 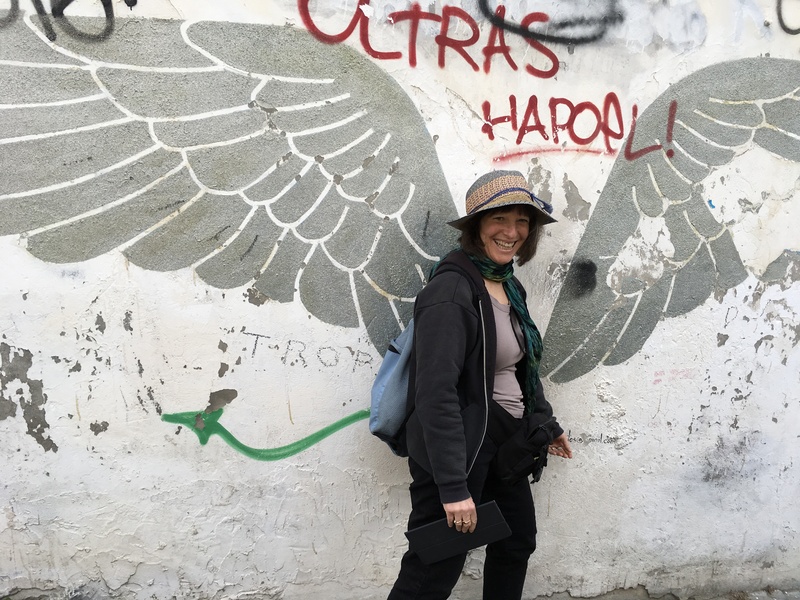 Our tour of Jaffa included graffiti and an introduction to a couple of Arab-Israeli artistic collaborations, Na Laga’at and the Jaffa Theatre. Na Laga’at is also a theatre company of blind/vision-impaired and deaf, hearing-impaired performers, but their center also contains the Black-Out Restaurant which is set in total darkness, in which the waiters are all blind or visually impaired. You tell me: am I devil or angel? 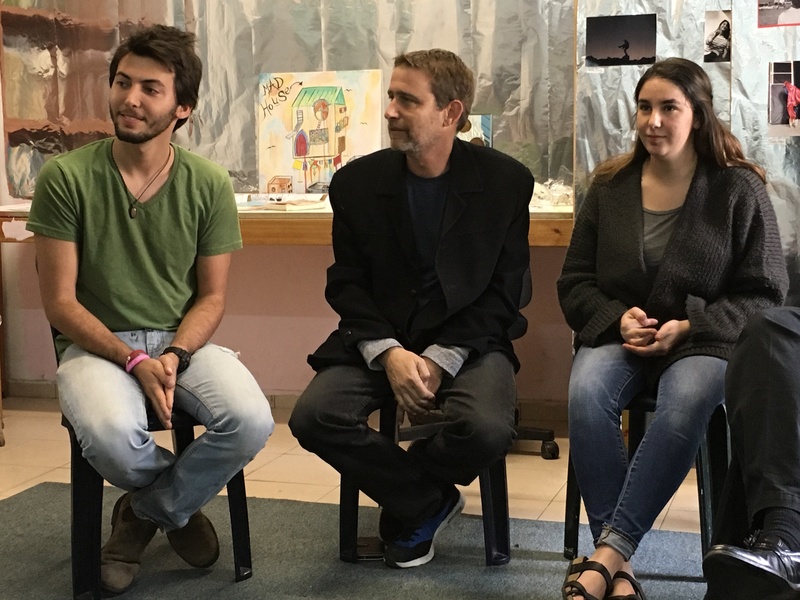 We then met with members of the Israel Movement for Progressive Judaism’s pre-Army mechinah (academy), a 10-month immersion into Israeli and Reform Jewish culture through study, volunteering, touring, and preparation for the Army, physically, emotionally, and morally. A key component of the program is when the young people are dropped off somewhere with no food or money in order to learn to trust both strangers and themselves for two nights — the first night asking to be housed by a stranger, and the second night living out on the streets! We then visited Independence Hall where David Ben Gurion proclaimed the State of Israel on May 14, 1948. 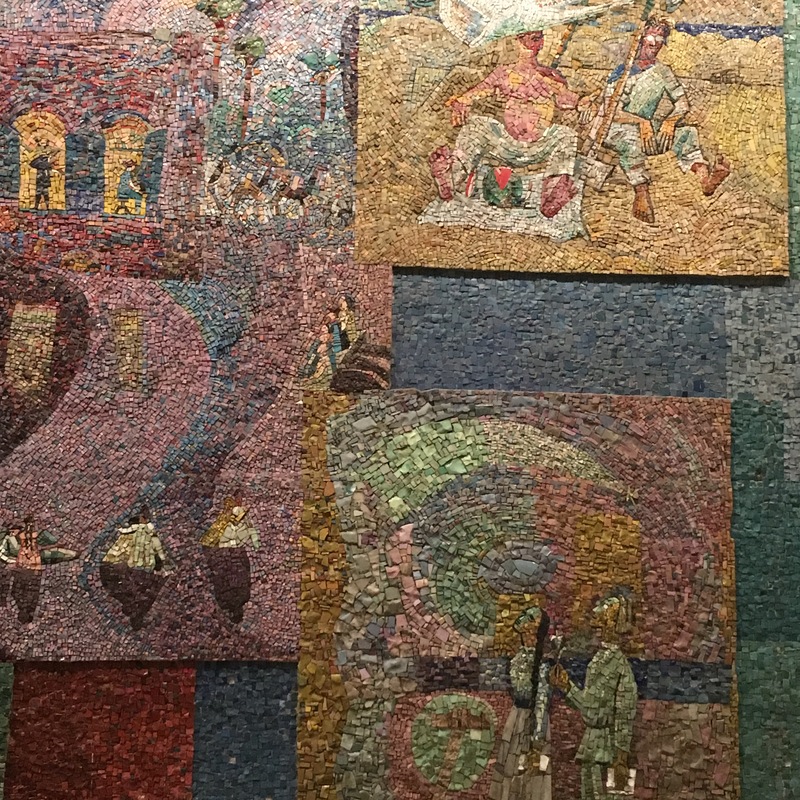 We also visited the Shalom Center where we got a tour of the colorful mosaics by Nahum Gutman which depict the history of Tel Aviv. 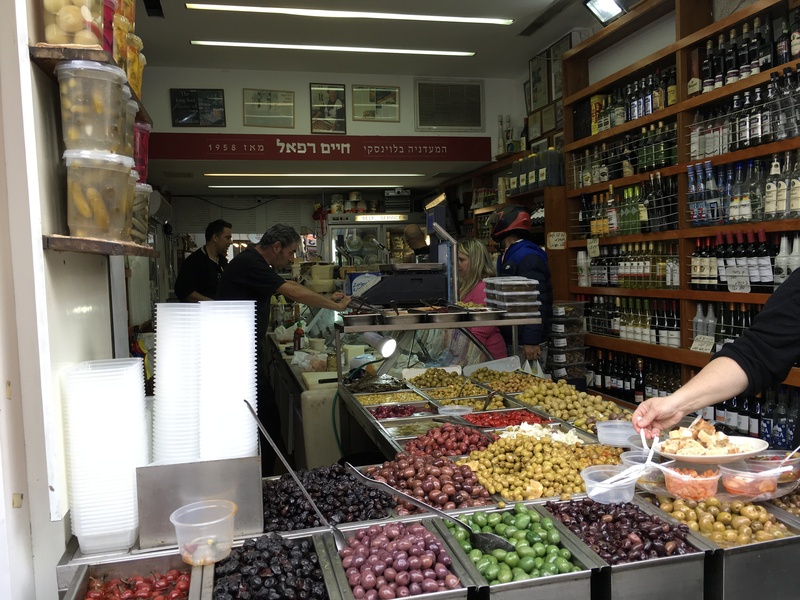 Our lunch consisted of an ethnic tasting tour, a walk through Tel Aviv’s famous Levinsky Market. 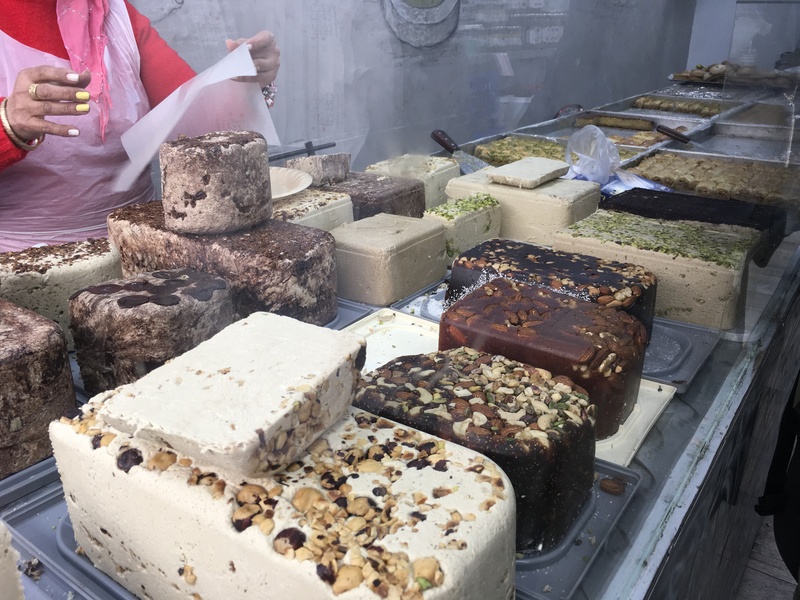 We “visited” Greece (for olives, cabbage rolls, beans, salmon and other salads), Turkey (for bourekas), Libya (for a nut/quinoa/lentil salad), Georgia (for a walnut and grape energy bar concoction), and Iraq (for halvah). 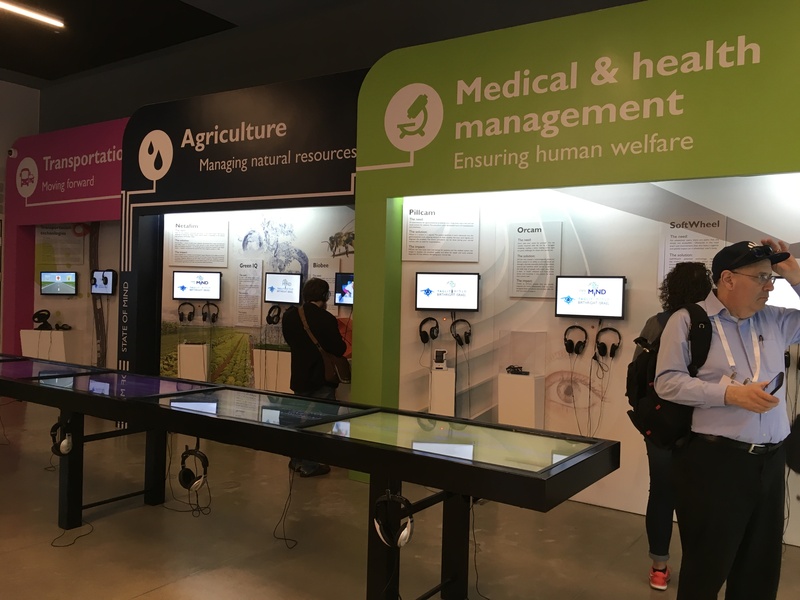 After this feast, we went to the State of Mind Innovation Center, sponsored by Taglit/Birthright, a museum dedicated to Israel as a start-up nation, with exhibits about the technologies that Israelis have created in the fields of science, medicine, agriculture, transportion (we all use the Israeli Waze app, right? 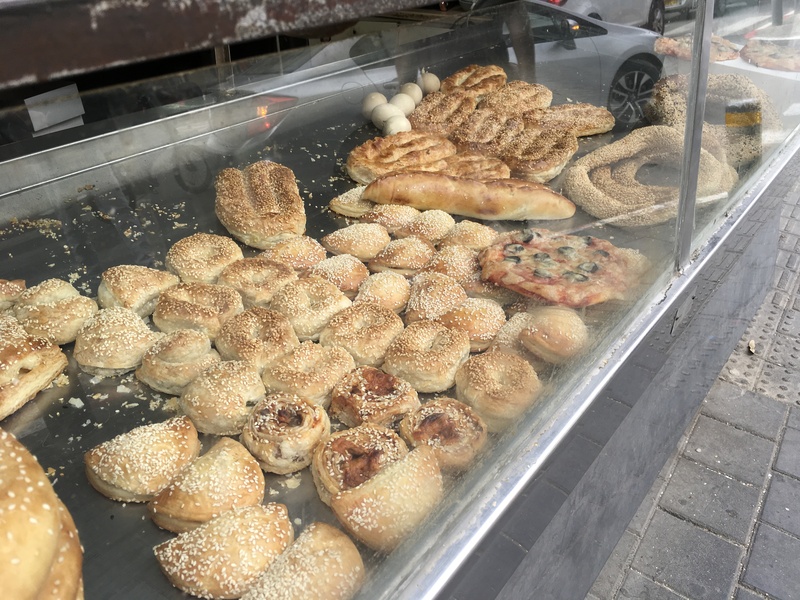 ), and safety/security (did you know you can download an Israeli app called the Salient Eye that will do home security from your phone?) 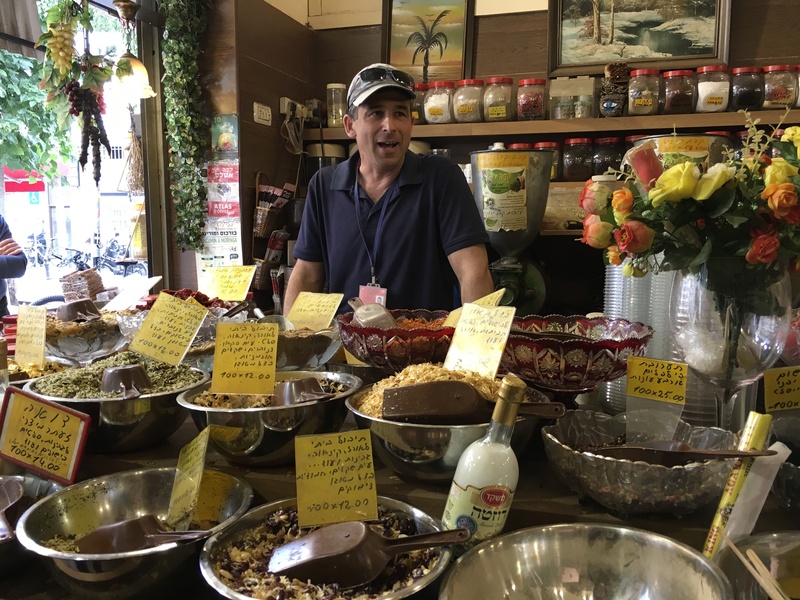 This was a feel-good place, indeed, (and not only because my friend Yosef Abramowitz’s company Energiya Global was featured). The medical advances included things like Orcam, Pillcam, Rewalk, and SoftWheel. And in the science field, I was amazed by a company called WaterGen whose machines can create water out of air (if there is at least 20% humidity). They are each worth a Google search! Our visit continued with a presentation by an entrepreneur who started a website buyforgood.biz which focuses on social impact products, and then we concluded with a fascinating conversation with journalist Nathan Jeffay about the (not very encouraging) state of Jewish and Israeli news coverage around the world. thank you for the blog. Reading it is like being there.